Mission 272+ Innovative Campaigning Ways! Innovative Campaigning has been the most defining feature of Narendra Modi’s 2014 Lok Sabha Campaign. It used multiple fronts beyond technology… Crowdsourcing Through India 272+ open forums, volunteers sent valuable inputs, ideas which became part of Narendra Modi’s speeches. It started way back in July 2013 where he used inputs through Facebook to address a gathering of students in Pune. The next big speech of Narendra Modi through crowdsourced was the one in Hyderabad Rally (August 2013) where he issued the clarion call - “Jai Telangana, Jai Seemandhra”. One of the most engaging Crowdsourced Campaigns during the 2014 race was the “Mere Sapno ka Bharat” led by Smriti Irani, an initiative where Citizens were encouraged to record short videos on the India of their dreams. Branding From NaMo tea stalls to NaMo Mobile Phones, from Saree shops to Sweet shops and from neck-tags, stickers, caps to sun-shades on Cars, brand NaMo was to be seen everywhere through the 2014 Campaign. Narendra Modi’s rallies were consciously branded to connect with local voters. His rallies UP were branded as Vijay Shankhnad Rallies, the rallies in Bihar were called Hunkar Rallies. In Karnataka if it was Bharatha Gellisi rallies, in Maharashtra it was Maha Garjana. The rally in Arunachal Pradesh was called Vijay Sankalp Abhiyan Rally, in Assam it was called Maha Jagaran Rally, in Goa it was called Vijay Sankalp Rally, in Himachal Pradesh it was called Parivartan Rally so on so forth. Knowing well that every seat matters the backdrop for Jana Chetna Sabha in Kolkata was India272+ the speech was about talking about the Bengali pride. 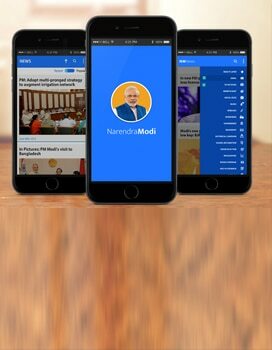 Innovative campaign titled “Chai pe Charcha”: A two way interactive digital platform between Narendra Modi and Voters was enabled across thousands of tea-stalls in India through a combination of technologies - DTH, Video Conferencing, Mobile Broadband, etc. Held across 4000 locations in 24 states in various rounds in India & Internationally it across 50 locations in 15 countries. Almost 10 lakh people joined the Charchas. 3D Holographic Rallies During the 2014 Campaign Narendra Modi, the pioneer in the use of 3D Holographic Projections in election campaigning, used it to deliver 12 speeches across 1350 venues during the months of April and May 2014. 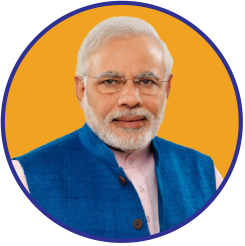 A Digital Eco-system Digital Ecosystem came together for Mission272+ during 2014 election campaigning with its unique features: its distributed nature of drawing on skills, resources and enthusiasm from across multiple platforms - official and voluntary. At the heart of the Mission272+ Digital Ecosystem was the BJP’s I.T. Cell and its National Digital Operations Center (NDOC) that ran a 360 degrees campaign across digital channels - web, mobile, social media, voice and sms. The game-changers during the campaign were: A single nationwide toll free number 78200-78200 where BJP supporters across India can give a Missed Call or send a SMS or a WhatsApp message as means to get involved the campaign. Further innovation in the use of SMS was NaMoNumber that gamified volunteering, the number of pledges of support a Volunteer could solicit from voters in his or her Constituency by getting them to SMS their EPIC (VoterID number). Together these digital innovations made a crucial difference to the campaign over the past 8 months. Political Movements at the National Level in India have broadly four schools of origin. The foremost historically was the Indian National Congress and its offshoots which include the present day Congress Party. The Communist movement that owes its origins to the erstwhile USSR and to some extent present day China has practically become irrelevant in India. The Socialist movement that traces its origins to Ram ManoharLohia and Jayprakash Narayan has since splintered into narrow regional or caste based parties with little national weight. Assorted regional parties and recent political upstarts can barely lay claim to any national space. At the national level the political space before India went polls in 2014 was largely dominated by the Congress Party with the BJP mostly looking like a Super Regional Party. To fully understand the magnitude of the 2014 Lok Sabha results in favor of the Narendra Modi led BJP one needs to recognize how the National picture stands flipped with the BJP occupying the dominant National Political Space stretching all the way across the North and the West while recovering ground down South and making heavy inroads into the East. In stark contrast lies the Congress which is not only down to its all-time historic low tally but has also now been reduced to a super-regional party with practically no presence in the large heartland states. Starting from Jammu & Kashmir it has no representatives in the Lok Sabha in the Northern States of Himachal Pradesh, Uttarakhand and the National Capital Region of Delhi. It has been reduced to single digits in Uttar Pradesh, Punjab and Haryana. To the west it has zero MPs from Rajasthan, Gujarat and Goa while Maharashtra its erstwhile bastion managing only single digits presence. In the South the Congress has zero MPs from Tamil Nadu and Seemandhra it has been reduced to single digit presence in Karnataka and Telangana. The Congress has no presence in Lok Sabha from Jharkhand, Nagaland, Odisha, Tripura and Sikkim to the east. Even most Union Territories turned their back on the Congress. The Congress today suffers the ignominy of having no state with double digit MPs in the Lok Sabha even as it is being challenged by Jayalalitha’s ADMK and Mamata Banerjee’s TMC for the principal Opposition space in the Lok Sabha. This is the magnitude of the damage inflicted by Narendra Modi’s campaign on the Congress Party.This however does not even begin to tell the story of how Narendra Modi has reshaped the BJP’s electoral landscape perhaps irreversibly so. With a record 282 Lok Sabha seats out of the 543 Narendra Modi is the first non-Congress leader to have led his party to a simple majority in the Lok Sabha. This is a national feat that has so far been the exclusive preserve of the Nehru-Gandhi family. If the magnitude of the win tells the story of the BJP’s national spread today it is the demographic complexion of the win that tells the real story of the BJP’s national depth. The BJP won 40 out of the 84 Lok Sabha seats reserved for the SC community, almost 47% of seats with many dalit Women MPs winning from these seats as well. The BJP also won 27 out of the 47 Lok Sabha seats reserved for the ST community, almost 69%. The NDA alliance between the different parties garnered a staggering 62% of all SC seats and 70% of all ST seats. With 28 women Lok Sabha MPs the BJP also hit a new benchmark of 10% of its tally going to women. Narendra Modi has not just led the BJP to victory on terms unimagined but has done so riding on the back of wave a demographic wave of aspirations unlike anything the BJP had ever managed in the past. Narendra Modi’s BJP has shattered all previous political stereotypes traditionally associated with the Vajpayee/Advani era BJP of the 1980s-190s and the erstwhile Jan Sangh. The social coalition that Narendra Modi has stitched is unique in its demographic complexion, its geographic spread, its gender mix and its mandate. This is a mandate for Narendra Modi to realize the neo-aspirations of a large swathe of the population cutting across caste, regional and religious fault-lines. It has empowered him to take India in a new direction without bowing to any kind of parochial pressures, without giving into any kind of petty piques and without indulging anybody’s sense of entitlement to pelf or privilege in the next Government. This mandate also marks the beginning of a new epoch in the broad political movement that gave birth to the Jan Sangh in the 1950s and the BJP in the 1980s. If its first generation was the Dr. SP Mookerjee, Pt. DeendayalUpadhyay era and its second generation was the Atal Bihari Vajpayee, L.K. Advani era, we now mark its third generation under Narendra Modi. Apart from the national mandate to govern India he now also has the political mandate to remake this movement to reflect his philosophy of Governance. A billion dreams and aspirations now look up to Narendra Modi. As he goes about the process of forming his government it is these dreams and aspirations that must shape and influence the composition of his team and nothing else.